One Zouves Fertility Center IVF miracle is growing up and making a big difference! CHP officers call little Bobby Redman a superhero. 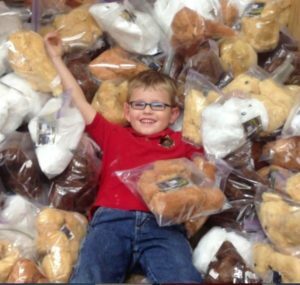 Through his foundation, Bobby’s Bandaid Brigade, Bobby has donated enough teddy bears to comfort 5,000 kids. When Bobby heard about this situation, he knew he could make a difference. Bobby, along with his friends and their parents, donated enough money to put a teddy bear in every CHP 1st responder vehicle throughout the entire state of California. That was just in Bobby’s first year of effort. Bobby will be a third grader next year. He has hosted fundraisers for the CHP for the past three years now and he has no plans of stopping!